Diabetes has reached epidemic proportions, and the cardiovascular complications of diabetes are life-threatening and disabling. This book is unique in providing a simple explanation of the biochemical role of PKC in diabetes complications, which allows clinicians to understand why PKC inhibitors (in development) are an exciting prospect for future treatment to slow progression of eye & foot complications. Each chapter is short and succinct, focusing on ‘best practice’. There are key learning points at the end of each chapter, with numerous helpful tables, figures and clinical images. SECTION 1. MICRO- AND MACROVASCULAR COMPLICATIONS OF DIABETES. Chatper 1. The burden of diabetes complications. Chapter 4. Coronary heart disease and diabetes. Chapter 5. Diabetes and cerebrovascular disease. Chapter 7. Evidence0based interventions to prevent or retard vascular complications. SECTION 2. 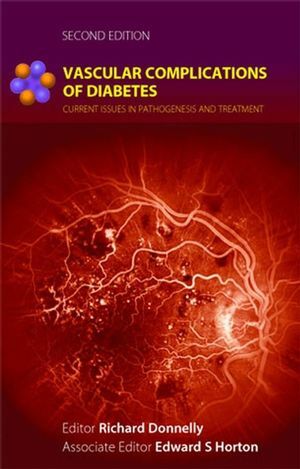 DIABETIC RETINOPATHY AND ASSOCIATED OPHTHALMIC DISORDERS. Chapter 8. Diabetic retinpathy: epidemiology and risk factors. Chapter 9. Classification and diagnosis of diabetic retinopathy. Chapter 10. Pathogenesis of diabetic retinopathy. Chapter 12. Proliferative diabetic retinopathy. Chapter 13. Non-retinal diabetic ocular complications. Chapter 14. Pictorial case studies. Chapter 15. Diabetic neuropathy: epidemiology and risk factors. Chapter 16. Classification and diagnosis of diabetic neuropathy. Chapter 17. Pathogenesis of diabetic neuropathy. Chapter 18. Treatment of diabetic neuropathy. SECTION 4. PATHOGENESIS OF GLYCAEMIC VASCULAR DYSFUNCTION. Chapter 20. Protein kinase C.
Chapter 21. Protein kinase C activation and vascular permeability. Chapter 22. Harmful effects of protein kinase C activation in cardiovascular and renal tissues. Chapter 23. Therapeutic potential for isoform-selective protein kinase C inhibitors.